OLEDs have been around since the early 2000s and in recent years, OLED technology has been developing in leaps and bounds. OLEDs are quickly becoming the display of choice for smartphones, wearables, TVs and VR headsets. The image quality of OLED displays is the best ever and OLEDs are efficient, thin and light. Flexible OLEDs are now entering the market – and the future will bring us foldable, rollable and stretchable OLEDs, that will enable new types of devices we cannot even imagine today. The OLED display market grew rapidly in the last few years, and in 2018 it is estimated that around 500 million OLED displays were produced – generating over $25 billion in revenues. The market is expected to grow quickly in coming years – fueled by high demand for OLED displays for smartphones and TVs. DSCC estimates that by 2022, over a billion OLED panels will be produced annually which will drive OLED sales to reach almost $50 billion. The mobile OLED market is dominated by Samsung Display, who started producing AMOLED displays in 2007. More display producers are rushing in to join the market, including LG Display, BOE Display, Everdisplay, Visionox, Truly, Sharp and AU Optronics. The OLED TV market is also growing, with almost 3 million OLED TVs expected to be produced in 2018. The only OLED TV producer is LG Display – but it is likely that more makers will enter this market, as it is expected that by 2021 the market will grow to over 6 million TV panels. 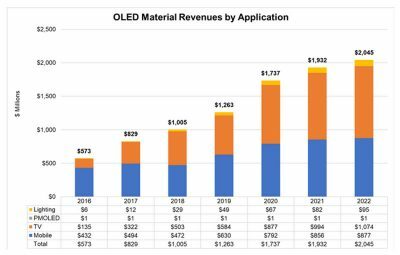 A rapidly growing OLED industry requires a significant amount of OLED materials. According to DSSC, the OLED market is set to grow from just over $1 billion in 2018 to over $2 billion in 2022.